HAMBURG, 24 October 2014 (IRIN) - When a video emerged last month of security guards physically abusing a resident of a refugee housing facility in the German town of Burbach, the ensuing media furore shone a light on an asylum system straining under the weight of an unprecedented caseload. The video showed a young man handcuffed and lying on a mattress covered in vomit with a guard standing next to him. After police confiscated the guards' cell phones, a photo was also found showing one of the guards standing with his foot on an Algerian refugee's neck. Over 130,000 asylum applications were made in Germany between January and September this year, by far the largest caseload in the European Union in terms of absolute numbers (as a percentage of the population several smaller countries such as Sweden, Malta and Austria have a higher "burden" of asylum seekers than Germany, the largest country in the EU). The Ministry for Migration and Refugees estimates that the number will reach over 200,000 by the end of the year, the highest level since the country received a large influx of asylum seekers during the Bosnian conflict in the early 1990s. In June, the government approved a plan to grant temporary asylum to an additional 10,000 Syrians, primarily those with relatives already in Germany. Two similar programmes in 2013 brought another 10,000 Syrian refugees to the country. Although the number of Syrian refugees in Germany lags far behind - in both absolute and relative terms - the numbers in Turkey, Lebanon and Jordan, a quarter of asylum applications in Germany during September 2014 were from Syrians. The Migration and Refugees Ministry, which processes asylum requests, has an estimated backlog of over 100,000 applications. In an effort to shorten the current average wait time of seven months to respond to each asylum claim, the Ministry is set to hire hundreds of new employees over the coming months. Meanwhile, Germany's infrastructure for housing asylum seekers is showing signs of buckling under the pressure, with conditions deteriorating at overcrowded refugee shelters. New asylum seekers are required to live in a short-term shelter for up to three months after they file their asylum applications. Afterwards, they are supposed to be moved into longer-term accommodation or, in some states, a private apartment, but the shortage of such housing is resulting in longer stays at increasingly over-stretched temporary shelters. Following the revelations of abuse in the town of Burbach, 92km southeast of Cologne, asylum seekers at shelters in Hamburg and in the state of Saxony reported that they had also been abused by security guards. In early October, the public broadcaster NDR reported abuse allegations at a Hamburg shelter on Schnackenburgallee, which currently houses about 1,200 asylum seekers, just over 300 of whom were living in tents as of mid-October. Most others are staying in containers more commonly found on construction sites. The containers, converted into small living spaces with four or five beds, have become a widespread form of housing for asylum seekers across Germany. Germany's 16 states are assigned a proportional number of asylum seekers, with more populous states taking in more refugees. Only 2.5 percent are sent to Hamburg, but the city's shelters are experiencing many of the same problems as others around the country: overcrowding, poor conditions and allegations of abuse by staff. On a Friday afternoon in October, a group of men from Syria stand outside the entrance to the Schnackenburgallee shelter. Some of them have been living there for well over six months despite the fact that Schnackenburgallee is a short-term shelter which, along with a former post office building in the Hamburg neighbourhood of Harburg, was opened earlier this year to house the city's rising number of refugees. Both shelters are already overcrowded due to the lack of space at longer-term refugee housing, says Frank Reschreiter, a representative of Hamburg's Interior Ministry. Tents had to be pitched on the grounds of the Schnackenburgallee shelter and in front of the building in Harburg months ago, but Reschreiter says residents are gradually being moved out of them. "We want to have all the tents gone by winter," he said. Alaa Hegazi, 28, from Syria, has been at Schnackenburgallee for nine months and is sharing a small container with four other men. He said he was expecting to be transferred to different housing in two weeks, but one week after he spoke to IRIN, city authorities informed him that he would be deported to Spain at the end of the month. The EU's Dublin Regulation allows Germany to deport asylum seekers to the EU country where they first registered their asylum claim, most often Mediterranean countries such as Italy and Greece where the majority of asylum seekers enter the EU. Alaa Hegazi came to Germany after registering as an asylum seeker in Spain. Residents at Schnackenburgallee complain that the food makes them sick, they wait hours to speak with social workers, and share one bathroom with dozens of other people. They also accuse some of the security guards of being aggressive and unable to communicate with them. Although the containers most residents live in are small, they are considered preferable to the tents, where 20 or 30 people sleep in rows of bunk beds. Zeneb*, 29, from Afghanistan, had to stay in one of the tents outside the Harburg shelter with her three children when she arrived in Hamburg a month ago, despite being eight-months pregnant. "They put me in the tent because there was no room in the building. It was so cold at night and the bed was so uncomfortable," she said. After becoming sick, Zeneb and her family were given a room inside the building. City authorities recently announced that Hamburg will provide housing for another 2,800 refugees in 2015, most of whom will have to be housed in temporary accommodation such as tents and containers, according to the Hamburg Refugee Council. A new study (in German) from Pro Asyl, a German refugee rights organization, found that seven of Germany's 16 states have no minimum standards for refugee housing. Bernd Mesovic, deputy director of Pro Asyl, said some states house asylum seekers in apartments, while others have relied on large shelters and temporary makeshift housing, like containers. In Bavaria, where 15.2 percent of refugees are housed, the newspaper Süddeutsche Zeitung recently published photos of refugees sleeping outdoors and crowded into a tent that had recently been used for the Oktoberfest (beer festival). Meanwhile, over 2,300 refugees in Munich are living in a former military barracks that has been converted into a shelter. 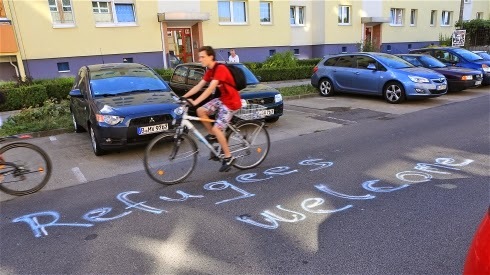 "Germany should be able to handle a certain amount of fluctuation in the number of refugees," commented Mesovic. "Long-term public housing should be built that can accommodate refugees and others who need it." Right to work largely "symbolic"
Last month, the German Bundesrat (upper house of parliament) approved a new law that gives asylum seekers the right to work after three months in the country. Previously, asylum seekers could work only after nine months. The new law, which will go into effect after being signed by President Joachim Gauck, specifies that during an initial 15-month period after asylum seekers arrive, they can only be considered for a job if no qualified Germans or foreigners with work permits apply. According to Mesovic, the new law is unlikely to improve asylum seekers' living conditions. He described it as largely "symbolic", noting that asylum seekers are unlikely to find work within months of arriving in Germany. "There are few people who would hire them," he said, adding that many asylum seekers would first need help learning German and having their professional qualifications recognized. As the political debate continues about how to fund and manage adequate refugee housing, Germany is one of 25 EU countries participating in Mos Maiorum, a campaign to round-up undocumented migrants launched on 13 October and expected to last for two weeks. Out of 240 reported identity and border checks documented on a crowd-sourcing website since Mos Maiorum began, 104 of the incidents have been in Germany. However, a spokesperson with Germany's federal police said the number of arrests in connection with Mos Maiorum would only be announced after the campaign ends on 26 October.